Important OSHA Uniform Sanitation Standards | Ace Uniform Services, Inc. The Occupational Safety and Health Administration (OSHA) has its own set of standards regarding sanitizing uniforms. Keeping your uniforms clean is one of the most important things you can do. Because that importance cannot be overstated, the Occupational Safety and Health Administration (OSHA) has its own set of standards regarding sanitizing uniforms. Local governments, especially at the county and state levels, will have cleanliness regulations as well. It’s all in the name of customer service and protecting consumers, employees, and businesses alike. Now let’s get a closer look at the most important OSHA uniform sanitation standards. Observe all procedures in the Bloodborne Pathogens Standards. All employees should minimize exposure to contaminated laundry. All contaminated laundry should be bagged up on site where it was used; sorting or rinsing the laundry will only make the process take longer. All laundry needs to be placed in leak-proof bags or containers that are also correctly labeled and color coded. At the state level, these regulations will look the same, more or less. 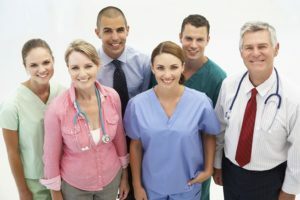 However, in some cases, particular states will be even stricter when it comes to making sure that every healthcare employee’s uniform is sanitized properly. Let’s look at one such state: Colorado. In Colorado, the Department of Public Health and Environment mandates that hospitals must provide their patients with fresh linens and regular laundry services. Anything that can be washed should be washed, and it needs to be overseen by someone who knows what they’re doing. However, all hospitals and other facilities can only use commercial-grade washers and dryers to ensure that all of their contaminated laundry, including soiled uniforms, are adequately cleaned before being returned to service. To give your business a clean, professional, and cohesive look, rely on Ace Uniform. Whether you need uniforms in the food, automotive, industrial, construction, medical, security, or you-name-it industry, we can provide you with the uniforms you need for the price you want. Give us a call at 1-800-366-1616 or visit us online to learn how we can help meet your needs. Want to get to know us even better? Visit us on social media on Facebook, Pinterest, Twitter, and LinkedIn. This entry was posted on Friday, April 5th, 2019	at 2:07 pm	. You can follow any responses to this entry through the RSS 2.0	feed. Both comments and pings are currently closed.